I'm new to this forum, but you guys did open my eyes: I love pixel art, I love 3d art, but never thought to mix them together, and never thought it would look great. So as my first 3d pixel art, I did a car. Not very original, but a good model to start with: not too hard, yet not too boring. I got my inspiration from the already famous kenneth. All done with Blender and Gimp. 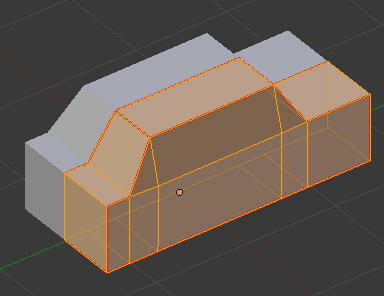 I know there is this ugly seem right in the middle, because I used mirrored UVs. It doesn't appear in the realtime version, but this is still annoying. If anyone knows how to get rid of it in Blender, thanks. Done in 2 hours, but now that I got the workflow, my next model should take less time. Next time I want to make a character. I think the issue could be 1 of two things. Firstly, it could be the mip-mapping. Turn off all of the mip-map related features, and maybe turn off anti-aliasing. That should get rid of the seam. Either that, or get rid of that edge loop and rebuild the texture.